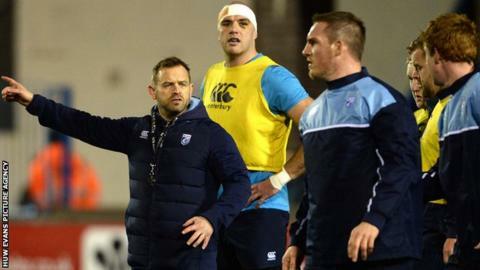 Head coach Danny Wilson says it would be a huge achievement for Cardiff Blues to finish in the top six of the Pro12. Blues lost four of their five opening games of the season, but have won on their last three outings. They are eighth in the table, five points behind sixth-placed Munster and European Champions Cup qualification. "We have a genuine opportunity to finish in the top six and if we did it would be a massive achievement," said Wilson. "We're moving into a period of must-win games if we are going to give ourselves a chance of moving into the top six." The first of those matches is against east Wales rivals Newport Gwent Dragons at the Arms Park on Sunday. That is followed by another Welsh derby match against Ospreys on Judgement Day IV at the Principality Stadium on 30 April and a trip to Edinburgh on the last Saturday of the regular season. Blues and Dragons go into Sunday's clash off the back of impressive away wins. The Dragons beat Gloucester 23-21 at Kingsholm in the European Challenge Cup while Blues beat leading Welsh region Scarlets 28-22 away in the Pro12. "This will be a massive win off the back of a huge win for the Dragons and then the Ospreys after that is another big Welsh derby," added Wilson. "They're great games to play at this end of the season when we've got something to fight for and what's pleasing for us is we do have something to fight for. We're not playing to make up the numbers. "Getting into the top six would be massive considering how the season started." Blues pipped the Dragons 21-20 in December, having been dominated for much of the game. That was one of three derby wins for the Blues this season, a specific performance target for the team according the Wilson, who expects Dragons to pose a major threat. "You can't look further than the result against Gloucester," he said. "That is an outstanding win at a packed house in Kingsholm in a European quarter-final against a fully-loaded Gloucester. "It's quite an achievement and just shows what the Dragons are capable of. "You want to win every single game but derbies have got an extra spice to them. "Two of our remaining games are derbies and I think it will be an unbelievable achievement if we win another two derbies having won three already this season. "And that would set us up for a final game at Edinburgh which we know is a very difficult place to go."